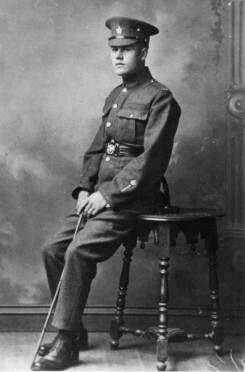 Ken Munro was 17 when he enlisted in 1914 in London, Ontario. In 1915 they sailed to Britain and were assigned to the 18th Battalion. Several months later the battalion was inspected by His Majesty King George V, and a few days later they left for France. After many battles, loss of life and injuries, they returned and were demobilized at Carling Heights, Ontario, May 1919. He was then employed at Kellogg's in London, Ontario. He maried Marion McNair in 1925 and they moved to Medina, Ontario where they ran a store, and the Medina Telephone exchange of the Blanschard municipal system. This was also there residence where they raised their children: Hugh and Ruth.